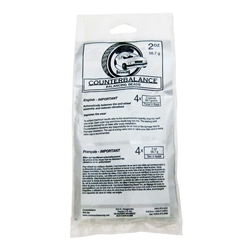 Counteract 2 oz Tire Wheel Balancing Beads - 4 pack Single Bag. Counteract Balancing Beads automatically balance the whole wheel assembly for the life of the tire. There are many advantages to a completely balanced wheel assembly, beyond extended tire life and an improved ride.